The look and design of MyMav and the MyMav sign-in page will be refreshed on Monday, May 1, to prepare for future enhancements. 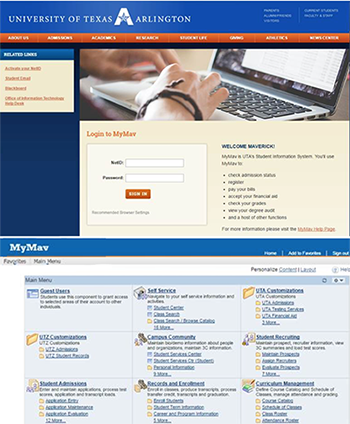 You will still sign in to MyMav at uta.edu/mymav and see familiar links to IT and student resources. The header and footer have been streamlined. All the functionality remains the same, but you will need to reset your favorites. Your menu items may look different from the screenshot, depending on your security access. This is the first of many MyMav enhancements underway through 2019. If you have questions, contact the HelpDesk at helpdesk@uta.edu.